Rectangular above, below and flush with grade vertical tube coalescing separators are used to separate and collect unwanted hydrocarbons from storm or process water. The VTC has a large internal storage with a simple and efficient rotary pipe skimmer to draw off separated oil for collection, and to ensure effluent discharge within compliance. Flow rates from 5 to 2,400 gpm in a single unit. VTC tanks are available in corrosion resistant fiberglass, stainless steel and carbon steel construction. The VTC removes hydrocarbons and settleable solids from industrial wastewater, process water, storm water and coolant. In operation, this separator accepts industrial liquid waste in the inlet chamber where settleable solids fall to the bottom as sludge for periodic removal. The waste stream then enters the coalescing separation chamber where AFL’s Delta-Tubes inspire laminar flow characteristics to the liquid as it passes through the separator. The result is a liquid more responsive to gravity separation. The Delta-Tubes also provide a coalescing medium for oil globules. Oleophilic in nature, they attract small oil globules, which coalesce with other globules, increasing in size and buoyancy, then break away to rise through the tubes to the top. 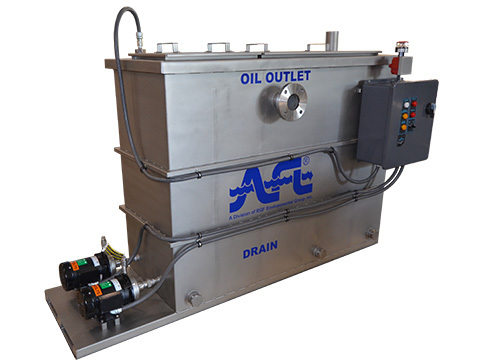 Surface oil drains by gravity into a Rotary Pipe Skimmer for discharge and/or collection. 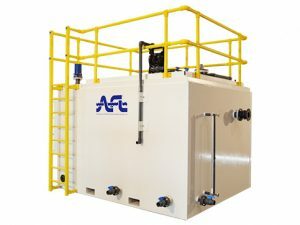 AFL’s VTC removes even mechanically emulsified oil leaving no visible sheen or suspended solids. In metalworking and similar applications, the VTC removes more than 99% of tramp oils from coolants. VTC models above 100 GPM incorporate a dual-wall, molded fiberglass construction as standard. Internally reinforced, the structure offers superior life expectancy and withstands heavy soil and hydraulic loadings when installed below ground. Stainless steel and epoxy coated carbon steel construction is offered as standard on smaller VTC models from 5 GPM to 50 GPM, and is also available as an alternative on larger VTC models where the requirement exists. The entire exterior surface of our fiberglass tanks is covered with corrosion-resistant gelcoat, integrally-colored and ultraviolet resistant. Since the fiberglass tank and PVC fittings are corrosion-resistant, the separator can be installed in harsh environments with no sacrificial protection required. Click on the Options tab above for a variety of equipment and construction options to meet your exact needs. AFL is happy to bring you a quick and easy solution to any upcoming projects requiring an oil water separator. For any projects which require immediate attention, AFL has a fleet of rental/demo units that are available to ship to your desired location. 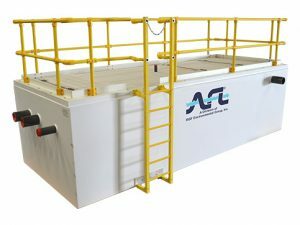 These units are often utilized for temporary needs such as new construction runoff, maintenance or refurbishing of existing units, or as an addition to an existing project. Please contact us for more information on rental/demo units.